LenovoStorage N4610 includes a total of up to 12 drive bays, for up to 72 TB of internal storage. 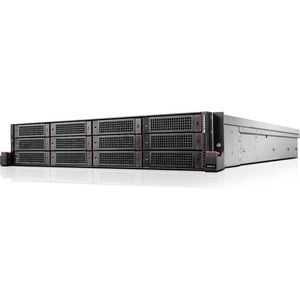 Plus, if you still need to expand your storage, the N4610 is interoperable with the ThinkServer SA120 JBOD, which expands storage capacity and supports tiering and caching. Lenovo AnyFabric and AnyRAID technology allow for up to 4 10Gb Ethernet ports and choice of RAID adapter, without using any PCIe slots. Using Lenovo AnyRAID design, you can integrate data protection in a fault-tolerant design, which helps reduce downtime while keeping your data secure and available. Plus, the latest Intel® Xeon® processors, large memory capacity, and loads of storage, combined with RAID choices and I/O options make the N4610 extremely flexible. Experience flexiblity featuring centralized storage management and unified file sharing using NAS file and iSCSI block technologies. The N4610 can run at 45-degrees Celsius (113-degrees Fahrenheit)without any time restrictions-without any impact on reliability. Addtional high-reliability feautures include Error Correcting Code (ECC) memory, hot-swap hard disk drive and SSD capability, hot-swap/redundant power and cooling. With Microsoft Windows Storage Server preloaded on the N4610, you save time. What's more, the interface is very intuitive and easy-to-use, which shortens the learning curve to get businesses up and running quickly.